Posted in: action. Tagged: action, classic, comic, comics, cover, poster, print, superman. And check out OUR NEWLY LISTED ITEMS. This is a fantastic full-color cardstock poster print of the cover to Action Comics #1, the classic comic issue which introduced Superman, and is arguably the most important comic book in history. There is no information on either the front or the back side (which is blank), regarding publishing information or the date these were made. This is the original name for DC National Periodical Publications, Inc. , and is also found in the same spot on the classic comic covers plaques that were made in the mid-1970’s (I believe mainly in 1974). So that would indicate these were made at the same time, particularly as there is an identical version of this in plaque form that came out in 1974. It is in very good undisplayed condition, with no pinholes, tears, or other major wear commonly seen on vintage posters or prints, and measures approximately 10″ by 14″. It’s on a cardstock type of paper, which is flexible, but thick enough that it can’t really be rolled. This is an amazing Superman collectible, and should be in the collection of every true fan. It would look fantastic displayed, particularly if you decide to have it framed. 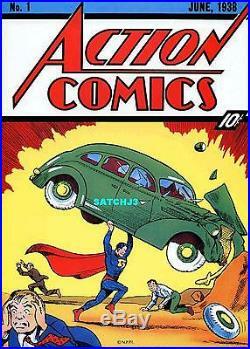 The cover to Action Comics #1 is likely the most important and most recognized cover to ever grace a comic book. It is also one of the most distinctive covers ever done, since Superman is of course regarded as a hero, not a menace throwing cars around. Action #1 is the all-time classic comic issue which featured the introduction, 1st appearance, and origin of Superman (Clark Kent), who along with Batman would become one of the 2 most important comic figures of the 20th century. Also features the first appearance of Lois Lane and Zatara in this issue. Originally published in June of 1938 by DC Comics, this is the single most valuable comic ever published, with values established well into the hundreds of thousands of dollars. It included story and art by legendary creators Jerry Siegel and Joe Shuster, who launched their famous creation in this issue. The cover features no text at all, and simply features the first-ever image of the Man of Steel, who has seemingly gone out of control. To overstate the importance of this issue would really not be possible, as it is a landmark not only in comic history, but in pop culture and American history as well. This issue launched the comic book explosion and Golden Age, so it is hard to think of a comic cover that a collector could more proudly display. These prints are incredibly difficult to find, and very rarely surface for sale. Don’t miss a rare opportunity to add this fantastic piece to your collection. Check out our other auctions for more great items. Check it out, you’ll be glad you did! The item “ACTION COMICS #1 SUPERMAN (1938) DC COMIC COVER POSTER PRINT 1974 CLASSIC CVR” is in sale since Monday, July 16, 2012. This item is in the category “Collectibles\Comics\Original Comic Art\Other Original Comic Art”. The seller is “satchj3″ and is located in Brooklyn, New York. This item can be shipped worldwide.